Although he's a showbiz lifer, Billy Vera is cut from a wholly different cloth than his peers. If an artist is measured by their devotion to their craft, Harlem to Hollywood may be the purest treatise on the subject ever produced. All the better, it's also an astounding story. Born into a white, suburban family, Vera fell for black music as a child and started down a winding performer's path that would buoy him the rest of his life. In the sixties, Vera paid his bills by songwriting (for other artists) through the day and playing mobbed up clubs at night. By 1967, as Newark burned on the other side of the Hudson, he and gospel singer Judy Clay, the first interracial duet to perform at the Apollo, tore the house down with a little ditty he wrote for himself: "Storybook Children " a commercial hit produced by Atlantic Records. Through the seventies, popular taste shifted drastically. As blue-eyed soul went out of fashion, Vera, like many other musicians, found himself scrounging for survival gigs, but one crucial difference set him apart: he abstained from the drugs and drink that fueled - and eventually claimed - so many of his contemporaries. As that decade sputtered to a close, a woman by the name of Dolly Parton recorded Vera's "I Really Got the Feeling" and hit number one on the charts. Riding the tide of this unexpected attention, Vera hightailed it to Los Angeles, formed a new band, Billy and the Beaters, and charted twice before the close of 1981 with songs from their eponymous album recorded live at the Roxy. Five years later, one of these minor hits, "At This Moment " was featured in several episodes of NBC's Family Ties. The song rocketed up the charts and a 42-year-old Vera found himself with his very own number one single. Nine visits to Carson and an American Bandstand appearance later, Vera tasted many other flavors of success: acting both on- and off-camera, producing records, and reissuing his own work. Today, with a star on the Hollywood Walk and Fame and a Grammy in tow, he's finally prepared to share his journey (did we mention that he's also a photographer and music historian who documented every step of career?). 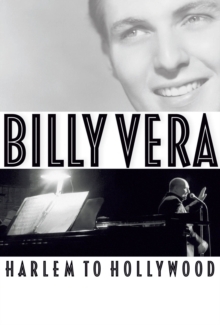 To sit down with Billy Vera is to take a personalized tour through nearly fifty years of entertainment history. Won't you come along for the ride?